The Central Council for Research in Homeopathy (CCRH) is an autonomous body of Ministry of AYUSH, Govt of India. The Central Council for Research in Indian Medicine & Homoeopathy (CCRIMH) had established by the Department of ISM&H, Ministry of Health & Family Welfare, Govt. of India in the year 1969 and started its functioning at E-25, Defence Colony, New Delhi. Dr. P. N. V. Kurup, the then Adviser of ISM&H ,Govt of India was the founder Director of the CCRIMH. In the year 1978, the Department of ISM&H, Ministry of Health & Family Welfare, Govt. of India had bifurcated the Central Council for Research in Indian Medicine & Homoeopathy (CCRIMH) and reallocated into four (04) Research Councils viz. Central Council for Research in Ayurveda & Siddha (CCRAS),Central Council for Research in Homoeopathy (CCRH), Central Council for Research in Unani Medicine (CCRUM) and Central Council for Research in Yoga & Naturopathy (CCRYN). In the year 2012, the Govt. of India again bifurcated Central Council for Research in Ayurveda & Siddha (CCRAS) in to two (02) Research Councils viz. Central Council for Research in Ayurveda Sciences (CCRAS) and Central Council for Research in Siddha (CCRS) with its head quarters in New Delhi and Chennai respectively. As on date, the CCRH has 23 Institutes/ Units and 05 Extension units functioning across the country.The major Institutes where IPD facilities available are at Kottayam (Kerala), Noida (UP), Gudivada (AP) and Puri (Odisha). About 370 regular employees and 500 contract employees in different categories are working all over India under CCRH. (Director General) from 03.07.2012 and till continuing. Shri Nilanjan Sanyal, IAS was the first Secretary of Ministry of AYUSH and who retired on 31.08.2015 on superannuation and Shri Ajit M. Sharon, IAS has assumed the charge of the office of Secretary AYUSH w.e.f 01.09.2015 and who retired on superannuation on 31st Marc h 2017. Shri P.N. Ranjitkumar , IPS is the new Joint Secretary of Ministry of AYUSH. Shri Vaidya Rajesh Kotecha, former Vice Chancellor of Gujarat Ayurveda University, Jamnagar has been appointed as Special Secretary to Ministry of AUUSH. Considering the importance of Yoga and other Indian systems of Medicine in our country, Our Hon'ble Prime Minister Shri Narendra Modiji allocated separate Ministry for Ayurveda, Yoga, Unani, Siddha and Homoeopathy (known as AYUSH) in the year 2014. Hence all the Research Councils and other Institutions functioning under Department of Indian Systems of Medicine and Homoeopathy are under Ministry of AYUSH, Govt. of India. Shri Shripad Yesso Naik is the first Hon'ble Minister of State (Independent Charge), Ministry of AYUSH, Govt. of India. Within a span of very short period after he assumed the Independent charge of Ministry of AYUSH, a lot of notable developments have been taken place and his Ministry is being taken timely action for further strengthening the Ministry of AYUSH and its Institutions across the Country. ​ As on 31st July 2017, we have 204 pensioners/ family pensioners. The necessity for the formation of the association was proposed by Shri M.S.P. Panicker (Former Assistant Director (Admn) who made all efforts to contact the pensioners residing different states. The association got registered under Travancore Cochin﻿ Literary Scientific and Charitable Societies Registration Act 1955. The first General Body meeting of the association held at Kottayam, Kerala on 29.09.2015. 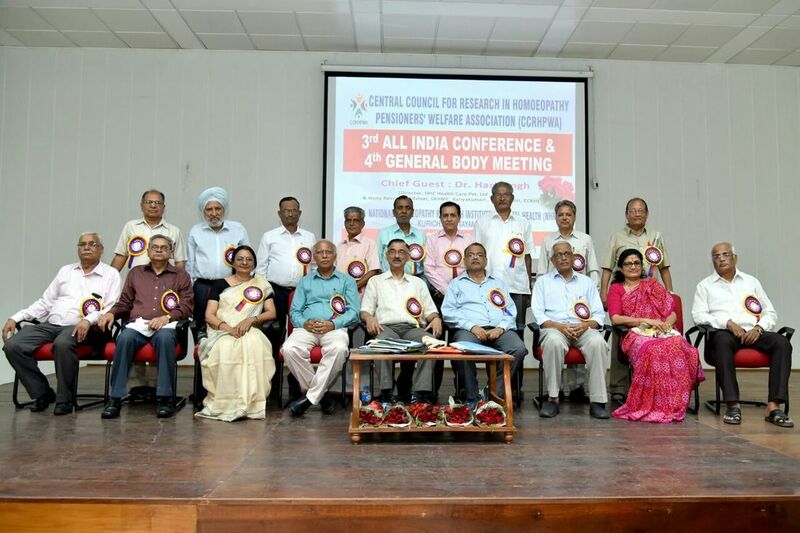 The second General Body meeting of the Association held in New Delhi on 17.03.2016 along with its first all India conference. The conference and official website of the association www.aiccrhpwa.weebly.com were inaugurated by Dr. R.K. Manchanda, Director General, CCRH, Ministry of AYUSH, Govt. of India. The second all India conference and general body meeting held at Regional Research Institute for Homoeopathy, Gudivada in Andhra Pradesh on 14th May 2017. The conference was inaugurated by Dr. CH. Raveendran, Officer in Charge, Regional Research Institute for Homoeopathy, Gudivada. New Director Board for 2017-18 has been elected and the details of which can be had from our site www.aiccrhpwa.weebly.com under caption board members.